VANCOUVER, BC / ACCESSWIRE / November 16, 2017 / Nexus Gold Corp. ("Nexus" or the "Company") (TSX-V: NXS, OTC PINK: NXXGF, FSE: N6E) is pleased to announce assay results from the first five reverse circulation ("RC") drill holes conducted at the Rakounga gold concession, located 109 km north of Ouagadougou, Burkina Faso, West Africa. Gold mineralization was intersected in four of the first five holes drilled on the property. Significant results were returned from holes RKG-17-RC-001 and RKG-17-RC-002, which returned extended intercepts of 26 metres grading 0.82 grams per tonne ("g/t") gold ("Au"), including two metres of 4.11 g/t Au, and 32 metres of 1.01 g/t Au, including two metres of 5.65 g/t Au, respectively. The current drill program is designed to test the mineral bearing potential of the artisanal workings (orpaillages) referred to as Koaltenga, Porphyry and Gounga. All five holes targeted the Koaltenga zone, an approximately 800m long active orpaillage. "We're pleased with what is an excellent start to this program," said Nexus senior geologist, Warren Robb. "We are encouraged with the extent of these intercepts and will continue to test these structures along strike," continued Mr. Robb. The 250-sq km Rakounga concession borders the Company's 38-sq km Bouboulou concession. The Company recently announced results from its maiden diamond drill program at Bouboulou, with nine of the first 10 holes successfully intersecting gold. Highlights of that program include 4.41 g/t Au over 8.15m, including 23 g/t Au over one metre, 5.21 g/t Au over 3.05m, including 15.50 g/t Au over one metre, and 1.04 g.t Au over 23m. Rock sampling completed by the Company at Rakounga has yielded positive results at each of the three orpaillages mentioned above. Four rock samples were collected from the Porphyry orpaillage returning elevated gold values of 19.95 g/t Au, 2.57 g/t Au, and 1.175 g/t Au, respectively. To date a total of eight gold bearing zones have been identified at the Bouboulou and Rakounga concessions. Drilling is ongoing and additional results will be released when received, reviewed and verified. Nexus Gold Corp. is a Vancouver-based gold exploration and development company operating in some of the world's premier mining districts. The Company is currently concentrating its efforts on two gold projects located in Burkina Faso, West Africa. The Bouboulou gold project consists of the 38-sq km Bouboulou claims and the adjacent 250-sq km Rakounga gold concession. 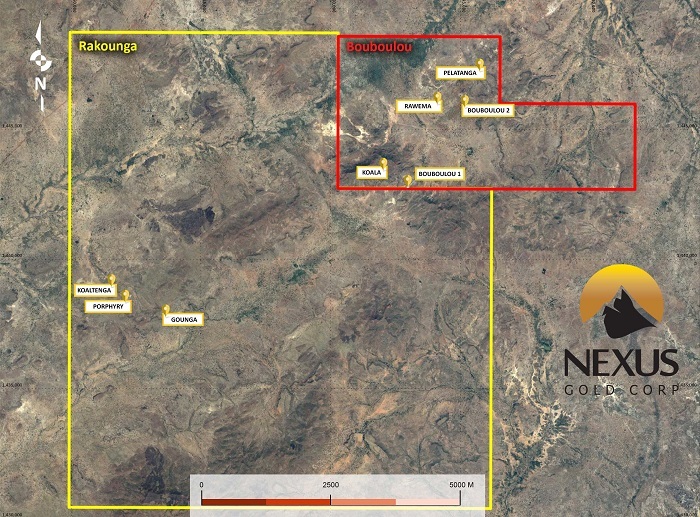 The Niangouela gold concession is a 178-sq km project featuring high grade gold occurring in and around a primary quartz vein 1km in length and associated shear zone. For more information on these projects, please visit the Company website at www.nexusgoldcorp.com. Warren Robb P.Geo., Senior Geologist is the designated Qualified Person as defined by National Instrument 43-101 and is responsible for the technical information contained in this release.